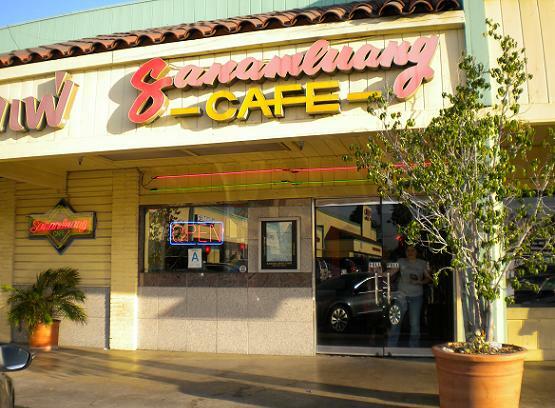 The only Pomona restaurant with a twin in North Hollywood, Sanamluang is located on Indian Hill Boulevard a few blocks south of the 10 Freeway, coincidentally enough in the same block as Mix Bowl Cafe, another well-regarded authentic Thai restaurant. Sanamluang’s interior is pretty funky, done in avocado, orange and brown, with an open feeling and odd angles. A friend and I got a booth and ordered three items: the Thai salad ($5.95), basically an American salad but with peanut sauce; seafood soup ($9.50), with shrimp, squid and mussels; and General’s Noodle, the dried version ($6.50), with noodles, shrimp, beef and pork. The food was fine, but we weren’t wowed, not even by the well-reviewed noodle dish. Sanamluang is certainly popular. It was a Friday night and the place was packed, with several large parties and a line out the door by the time we left. But service was poor. The restaurant was understaffed and no one even refilled our water glasses. I used to be a regular at Sanamluang, a streak that ended a few years ago when a roach crawled across our table, a server casually killed it and no one apologized or gave us a break on the bill. A friend enticed me to Mix Bowl and I came to love the place. I wouldn’t argue anyone out of liking Sanamluang. 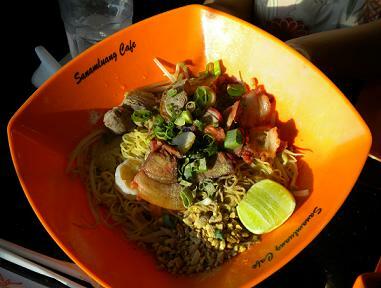 (Yelpers are evenly split, giving Sanamlaung and Mix Bowl identical 3.5-star ratings.) The interior is a step up from the neon garishness of Mix Bowl and some would prefer the food. I think Mix Bowl has better food and it inarguably has better service. Also, as my (female) friend put it after a close observation of Sanamluang, “The waitresses are prettier at Mix Bowl.” The importance of these things can’t be discounted. I’m out for the rest of the week. However, columns will appear in the Daily Bulletin in my absence, and a Restaurant of the Week will pop up here on Friday. Be patient if leaving comments. As usual, they won’t show up online until I can approve them, and I don’t know if I’ll have computer access. * Noon Thursday: I’m at an Internet cafe in Portland and posted the most recent comments. 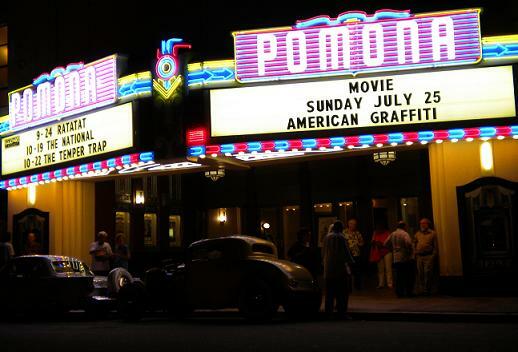 Movie buffs and car buffs, not to mention theater buffs, gathered Sunday to watch “American Graffiti” at the Pomona Fox Theater. 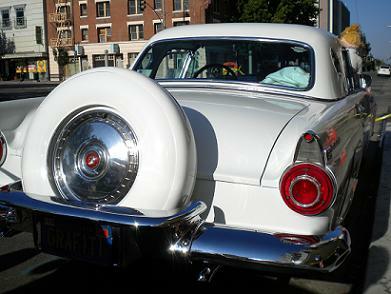 At right is Clay and May Daily’s 1956 Ford Thunderbird that was used in the movie. I had my flash turned off, darnit, so you can’t read the license plate: GRAFITI. Below is the marquee at night after the show let out. You can see a gallery of photos here or here. Warning: I’m in a couple of them. 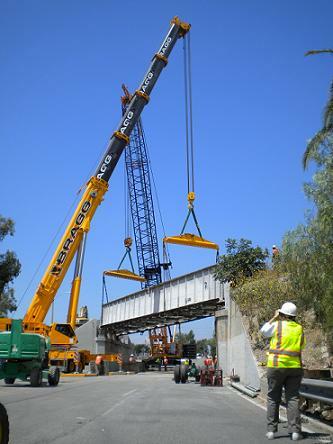 I watched Sunday morning as the old railroad bridge in Rancho Cucamonga was removed. (Click here for 28 photos by DB photographer Jennifer Cappuccio Maher.) I took a few photos myself, presented here. The second shows the bridge a few minutes later, being swung parallel to the road. 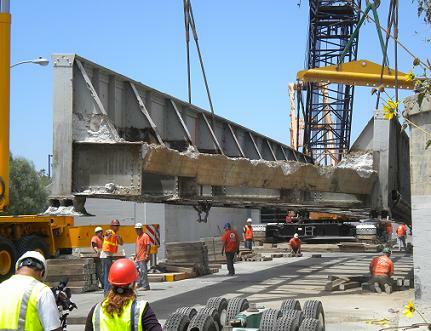 In the third, workers hurriedly build blocks for the bridge to temporarily rest on as the 165-ton structure is suspended above them. Yikes. From there a trailer was slipped under the bridge and it was moved a few yards east to a turnout for dismantling. It was resting there Monday morning. * My Wednesday column is about the bridge removal. They have 20 burgers, a variety of sandwiches and salads and some Mexican items, plus pancakes and omelets for breakfast. In that way they’re similar to the valley’s better burger spots, the ones that have expansive menus and seem to put more effort into things. I’ve been to the two longstanding Upland and Alta Loma Legends but more recently have visited the new one, which is technically in Upland but is only a block from the Claremont Colleges. Legends does a decent fast-food burger ($3.29), on a sesame bun with lettuce, tomato, purple onion, pickles and Thousand Island dressing, and a chicken gyro ($5.89), with tomato and onion, of similar quality. On one visit I got a small vanilla shake ($2.69), which is made with real ice cream. I found the food acceptable but nothing to rave about. 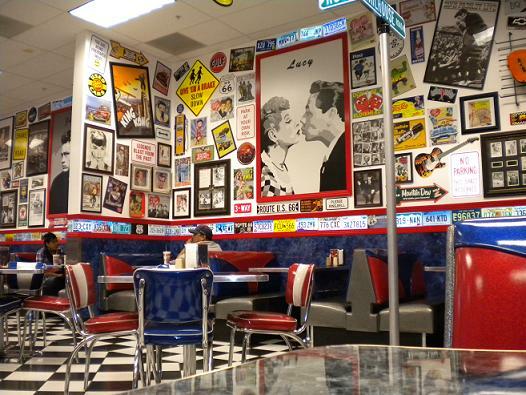 Legends’ decor, all four locations, might best be described as “aggressive kitsch.” Almost every square inch of wall space is covered in posters, tin signs, portraits and street signs, involving the usual suspects: I Love Lucy, James Dean, Marilyn Monroe, Elvis Presley and Route 66. Lining the walls is a string of license plates, one from each state, in alphabetical order. It’s overwhelming and a bit much for my taste, but the good thing is that Legends is so clean it almost gleams. The service is exceptionally cheerful. 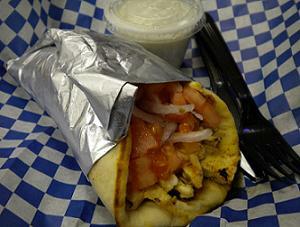 The food isn’t exactly legendary but the cleanliness and friendliness make for a positive experience. 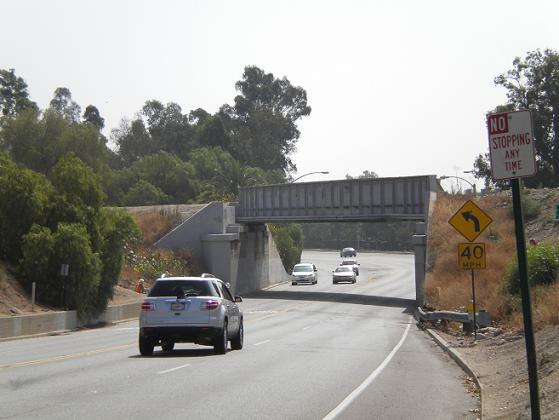 Here’s a last look at the quaint railroad bridge over Foothill Boulevard on the west side of Rancho Cucamonga. I shot this Wednesday morning from the west side of the bridge, looking east. 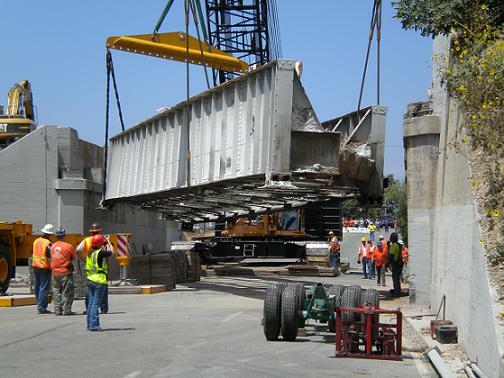 The bridge, installed in 1929, will be removed by crane Sunday. Did you know it weighs 110 tons? From there the street will be widened to six lanes over the course of the next 18 months. A new concrete bridge will be built for the wider span. Rather than trains, the bridge now carries cyclists and walkers as part of the Pacific Electric Trail. They’ll need to detour. 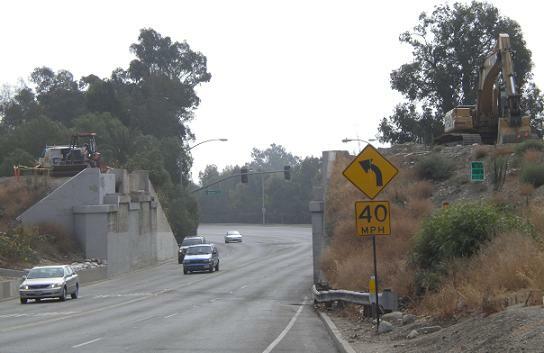 This weekend, so will motorists, as that stretch of Foothill will be closed from 7 a.m. Saturday until 7 a.m. Monday. Here’s the recent story explaining the whole thing. And here’s the Bulletin’s latest piece on the history of the bridge. I’ll miss the bridge and the rural charm of that portion of Foothill, from the Sycamore Inn almost to Vineyard Avenue. 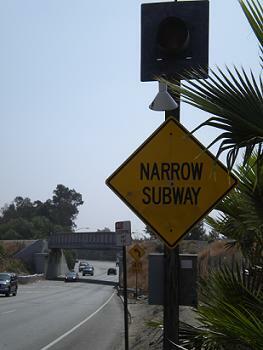 I’ll also miss the “Narrow Subway” signs with the flashing beacon on each end of the bridge. Soon it will be narrow no more. Now here’s some Chino trivia! 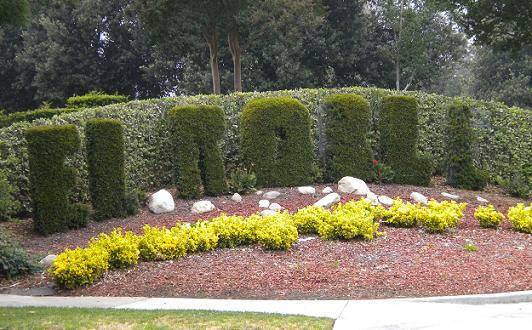 A couple of times recently in my column I’ve razzed the city of Chino for its brief, lame collection of trivia to celebrate, in wan fashion I must say, its centennial. Al McCombs, owner of the Chino Champion newspaper, picked up the gauntlet and concocted his own Chino quiz for his “Rolltop Roundup” column in Saturday’s paper. I have to confess I couldn’t get a single answer correct. But I learned a lot. And I was tickled by McCombs’ hands-across-the-valley plug for my column. On Sunday a group of us went to the Hollywood Bowl to see the Swell Season, She & Him and the Bird and the Bee in concert, each a male-female duo. We weren’t in our seats long when a couple about eight seats away got my attention: It was Cherie Savoie and Lee Tintary, whom I know from downtown Pomona’s Arts Colony. Perhaps even odder, I had run into them at lunch a few hours before in Claremont. Obviously we have similar tastes in food and music. But what are the odds you’ll run into somebody you know in a metropolis? This alone would have made me think “small world.” Minutes later, however, who should come walking up the steps past us but the dancing man from the Fox Theater concert in Pomona June 5. He’s the one who stood in the balcony dancing furiously by himself until one of our group asked him to sit down. And here he was in Hollywood. We recognized him immediately. Later we saw him take a seat in a box way down in front (in blue shirt). He sat still and enjoyed himself. Then, when She & Him launched into a spirited take on “Roll Over Beethoven,” we saw, in the twilight, from 150 feet away, the dancing man stand and begin shaking his moneymaker. Brackett Field was transformed into “Santa Barbara Municipal Airport” this week for filming. Thanks to reader Joanne Boyajian for the photo.